Can we discuss misperceptions for a minute? I wander along like I’ve got it all together and then BAM! A little thing that I took for granted pops up and shows me just how foolish I actually am. For instance, the lyrics to “Don’t Bring me Down” by E.L.O. I spent 40-something years thinking they were singing that Bruce -whoever and wherever he was- was a real bummer at a party and they’d had enough of it. Don’t bring me down, Bruce, ya jerk. Emphasis added. I figured Bruce also hated puppies and kittens. Imagine my shock when I learned just this week that they weren’t talking to some mysterious Bruce… they were singing a nonsense word they made up as a filler for that particular 3-count of the song; Groos. Groos? SERIOUSLY? Sigh. There goes all my backstory on the party pooper. Another common misperception is that salad is always rabbit food and the culinary equivalent of a hair shirt… Eat it because you should and it makes you a better person. Oh sure, you should eat a salad from time to time, but there’s no reason it can’t be crave-worthy. Case in point? 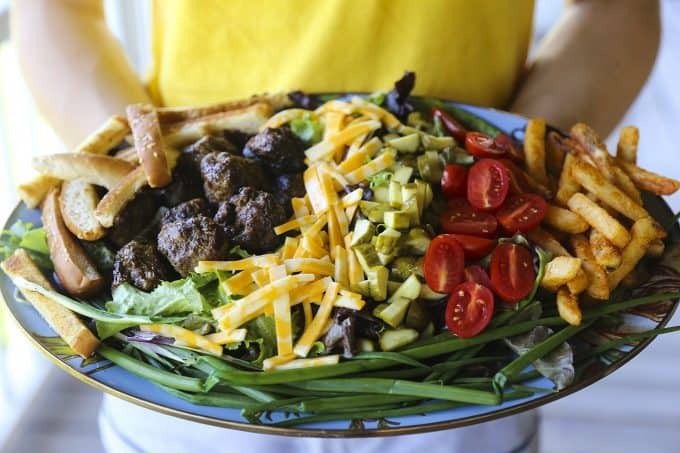 Cheeseburger Salad. It starts -as any self-respecting salad does- with a goodly pile of greens. That is where the similarity to punishment salads ends. All of your favourite things that make a cheeseburger as wonderful as it is start joining the party, and unlike Bruce, they don’t bring the Cheeseburger Salad down; grilled meatballs stand in for grilled burger patties, charred green onions, thin slices of cheese, dill pickle bites, burstingly fresh cherry tomatoes, crispy fries,and buttery toasted sesame bun strips. That’s right. I used crunchy French fries and butter-toasted, sesame-seed studded, soft burger bun strips for the croutons on this salad. I challenge you to tell me that Cheeseburger Salads are drudgery to eat. Don’t bring me down, man. You’re no Bruce. 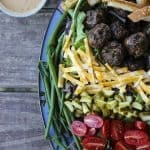 And while this gorgeous Cheeseburger Salad is a stand alone meal, just imagine how happy you’d make people (okay, yourself) if you served it with some Crockpot Mac and Cheese! The Grilled Meatballs I use in this recipe are found here. 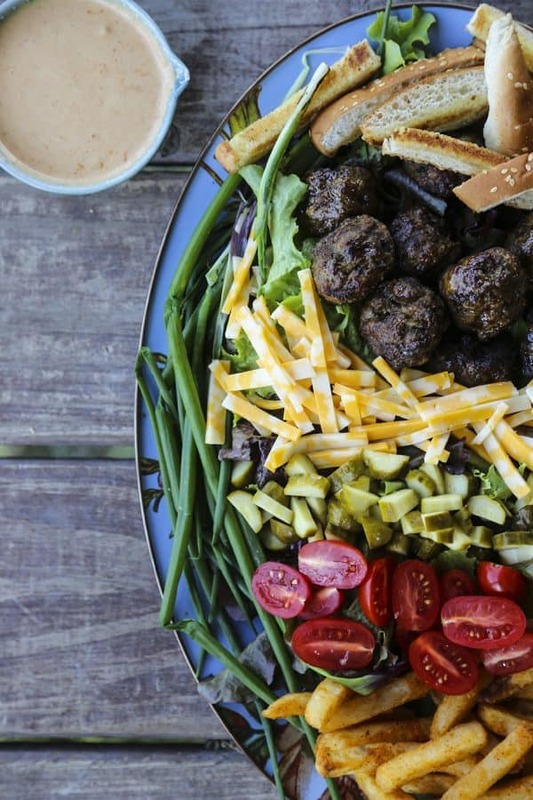 If you’re not in the mood to whip up a batch, I suspect you could make this salad with purchased meatballs, but I haven’t tried it. Also, you should maybe visit the doctor, because who doesn’t want grilled meatballs? That’s a clear sign of lethargy and probable impending death. Speaking of grilling things, I do advise charring the white part of your green onions for this Cheeseburger Salad. If you have a gas cook-top, you can hold the white part directly over the high flames with a pair of tongs and an oven mitt. Alternative solutions include laying on a high gas grill, or putting on a pan on a heat-proof surface and using a cooking or other sort of torch to blister the outside. No open flames handy? Lay them on a pan and broil, turning frequently, in the oven until they are fragrant and have some blackened bits. The reason for this is that it develops a sweetness in the green onions and removes some of the bite that gives you dragon breath after eating it. 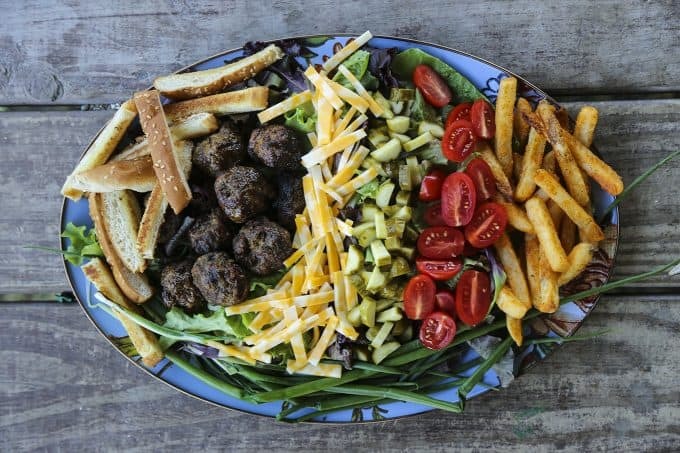 Arrange the mixed greens or lettuce on a large serving platter. Lay the oiled green onions on a hot grill or put under the broiler just until bits of them are charred. Flip and repeat. Arrange the charred green onions around the mixed greens or lettuce. Mash together the softened butter and minced garlic clove until you form a smooth paste. Spread over the cut sides of the sesame seed buns, then cut the buns into 1/2-inch strips. Place buttered side down in a heavy-bottomed skillet over medium high heat. Toast until fragrant and golden brown. Arrange along one end of the mixed greens. Pile the hot fries over the greens on the opposite end of the platter. Arrange the meatballs in a row next to the toasted buns. Follow this with a row each of cheese strips, chopped pickles, and cherry tomatoes. 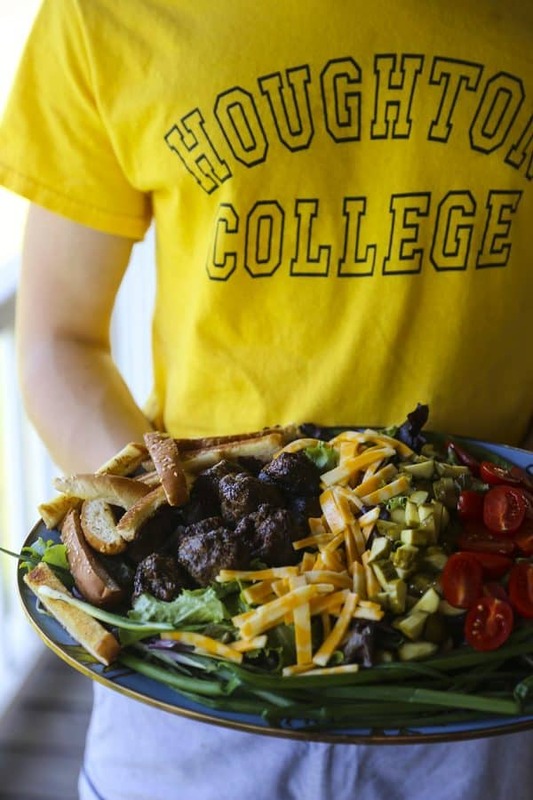 Serve immediately with a pitcher or jar of the Cheeseburger Salad Dressing on the side. 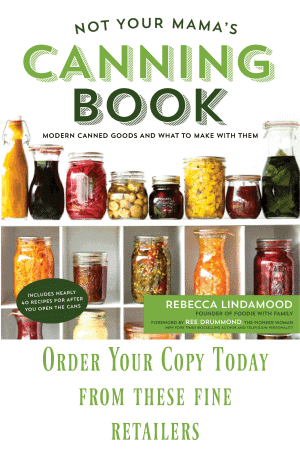 Don’t forget that Not Your Mama’s Canning Book: Modern Canned Goods and What to Make with Them is available through these fine retailers! This post was originally published June 29, 2016. Republished June 30, 2017 with improved Cook’s Notes and links. Love the advertising for Houghton College! LOL I’ve been doing this for a while. Guess great minds think alike! Precisely, I’m the same age and I thought it was “Bruce” too, until just a minute ago. 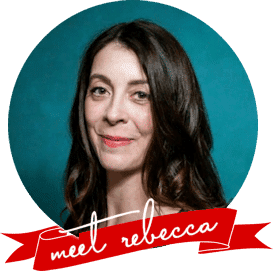 Oh you, Rebecca, you cracked me up. The same kind of misperception about a word or a phrase in a song has tripped me up, too. You made me smile! I would never make this, but I love, love, love, your creativity! Man/boy foods can be made a bit healthier and you have done that. 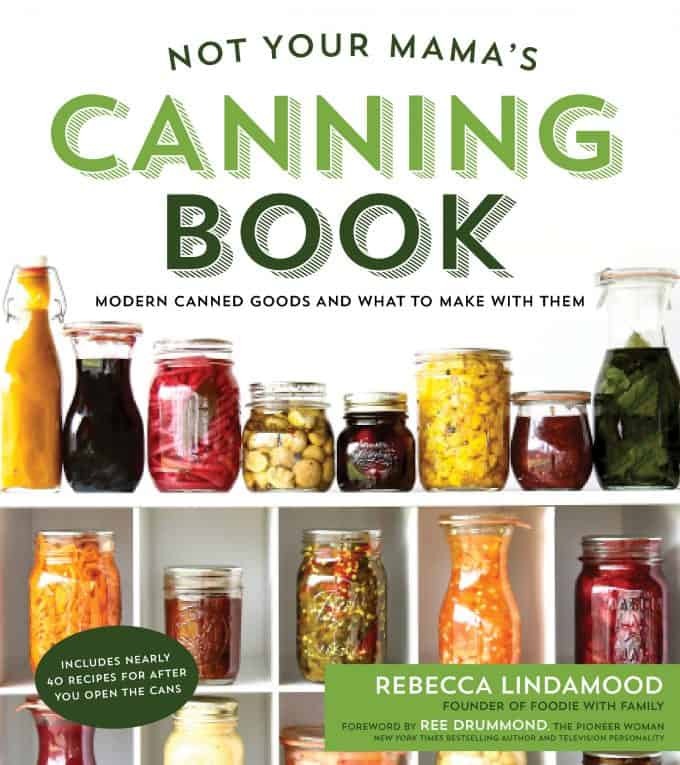 Yesterday I did can cherries in red wine from Not Your Mama’s, which continues to be one of my favorite canning cookbooks. As a Houghton alum, I just loved seeing the t-shirt. The salad looks tasty, too. OMG, I love you. This salad is GENIUS.